This was a labor of love. I fell in love with the scan of Kenshin by [ap]shaza[/ap], and just had to do something with it. My life as of late has been hectic, and I find the process of vectoring images soothing. It took about 40 layers and an infinite amount of shapes in Illustrator CS2, but I completed him in about 4 days work, working about 5 hours a day on it. When I finished, I was so proud of the work, I decided I had to make a wall of it, rather than just keep it to myself. So, the process became more lengthy! Now, I've never been good at backgrounds, so that took a while to come up with something. I took a page from the Rurouni Kenshin manga artwork, which seemed to feature a lot of stylistic elements from japanese cutting paper. I searched for patterns, but eventually settled for making a conglomerate of something I thought looked good. I vectored the flowers in the edges, though I was smart enough to reuse shapes for that. From there I gave it the scroll like look, and decided that was still not enough. 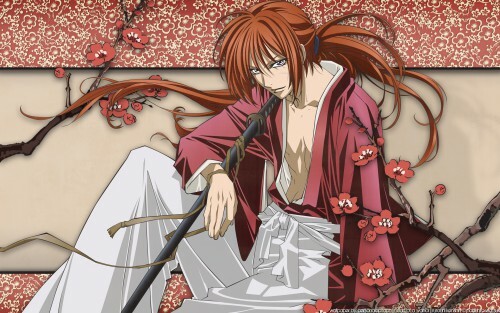 I searched the Rurouni Kenshin scan section until I came across [ap]turkman[/ap]'s scan. I didn't want to use all of it, and simply vectored the large sakura branches in the corner. This was the hardest part of the whole project.=( ) It took forever figuring out the shading for the branches, but I think the way they ended up suits the rest of the image. Once those were added to the wall, I added texture and shadows to get the full final image. I hope everyone enjoys! Shaza - The source scan for the vector of Kenshin, from their beautiful pencil board scan. Turkman - The source scan for the vector of the flowers used to decorate either side of the image. Awsum pic luv the anime and even the character duuh the walpaper 2o! This is such a beautiful work! Simple yet lovely! el inolvidable kenshin, se agradece el aporte. This is a lovely wallpaper. Nice wallpaper. Thank you for sharing.